JUBA, South Sudan (Morning Star News) – A Sudanese pastor in South Sudan was jailed and tortured for more than three months after Islamists who tried to kill him accused him of being a spy, sources said. Adam Haron, a 37-year-old convert from Islam and a native of West Darfur, Sudan, said Muslim extremists called him on Nov. 9 and 10 threatening to kill him if he continued to proclaim Christ among Muslims in Aweil, near the Sudanese border. Pastor of a church in an undisclosed area of South Sudan, Haron had gone to Aweil, about 800 kilometers (500 miles) northwest of the capital city of Juba, to plant a church. Evangelism is not illegal in South Sudan, where Christians outnumber Muslims, and the Transitional Constitution following the country’s secession from Sudan in 2011 guarantees religious freedom, including the right to propagate one’s faith. Haron said he knew the Muslims who threatened him as they were from his home region of West Dafur. The following day they tried to kill him when a Land Cruiser with no license plate nearly ran him over, he said. Haron, who came to South Sudan in 2010 after converting to Christianity in 2005, said that three days later six armed men, including three in military uniform, entered his hotel room in Aweil and started to search his personal bag and laptop and scattered his clothes around. They also took his cell phone. As the armed men ordered him to get into their car, they began kicking his legs and groin, he said. “Thank God, who protected me from serious injury from them,” he said. One of assailants took out a pistol, pointed it at Haron’s head, and asked him if he was a Christian pastor. He answered, “Yes, I am a pastor,” and they took him to a detention center in Aweil, he said. Haron said the three men in uniform were military intelligence personnel. Based on a military officer’s interrogation of him, he concluded that the radical Muslims had the military personnel arrest him after falsely accusing him of being a spy for Sudanese President Omar al-Bashir’s National Congress Party. On Nov. 15, two soldiers gave him 364 lashes using a tree branch as a whip, he said. “We will beat you every Saturday in this way,” one of them told him during the lashing. They threw him into a narrow cell, his legs bound with chains, he said. On Jan. 3 he was transferred to another jail cell. He was released on Feb. 18. In the course of his incarceration, those who arrested Haron stole 2,600 South Sudanese Pounds (US$820) from him, he said. Haron, who pastors an underground church made up primarily of converts from Islam, said he was gratified that the mistreatment tested his faith. “This detention has been a great encouragement to my spiritual life,” he said. 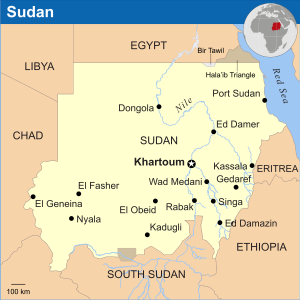 In the Sudanese capital of Khartoum, two pastors of South Sudanese descent continue to languish in prison following their arrests in December and January. Officials from Sudan’s National Intelligence and Security Services (NISS) are demanding that Peter Yein Reith and Yat Michael pay $12,000, but even that may not guarantee their release, sources said. Reith, from Khartoum but of South Sudanese descent, was arrested on Jan. 9 and is being held without charges. NISS officials arrested Michael, a visiting South Sudanese pastor from Juba, after Sunday worship at Khartoum Bahri Evangelical Church on Dec. 21. He also has been held without charges. Bashir’s regime, meantime, continues to bomb civilian targets in its war with rebels in the Nuba Mountains of South Kordofan state. On March 11 at 2 p.m., Russian-made Sukhoi jets bombed Tanase village, Bram County, wounding a 15-year-old girl, an area source told Morning Star News. Saloom Habil Tiya of the Sudanese Church of Christ was walking near her home when the bomb landed a short distance away. The source said the girl was seriously injured. There is no military installation near the area, the source said. “We hope the international community will pay attention to the crimes committed,” the source said.